Halloween is just around the corner. It’s the time of year for dressing up in fun costumes, colder weather, and transformation. Spooky decorations are up, sweet treats are out, and your wellness routine is changing, just like the seasons. We’re all about going with the flow and slightly altering our regimen depending on the time of year. 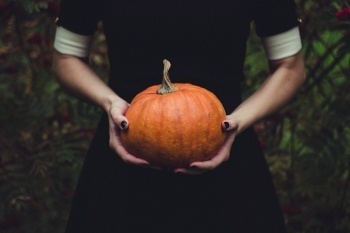 Here are a few tips to help you stay happy and healthy during Halloween holiday festivities. When the temperature drops, it may feel more challenging to get outside and exercise. But did you know that Fall weather is perfect for a brisk walk or jog around the neighborhood? Breathing in fresh air and working up a sweat is necessary all year. Don’t have time on weekdays? Try parking a bit further away from each place you drive during the week and take a lengthier walk to and from the car. Every little bit of activity helps. Some find that keeping track of their activity levels by using a step-counter or fitness app can keep them accountable. Others have noticed that enrolling in weekly fitness classes make it easier to stick to a consistent fitness schedule. Whatever works for you, create a plan and stick to it. That’s when you’ll see results. Why do treats need to be bad for you? Newsflash! They don’t! This Halloween you can treat yourself to a massage, infrared body wrap session, bubble bath, DIY pumpkin facial and much more. Take advantage of the readily available pumpkin themed items and pamper yourself. Many find that chillier temperatures make their aches and pains flare up. If this is you an infrared body wrap session may just be the cozy solution you need. Chronic pain can be lessened by frequent infrared exposure because infrared heat can work in accelerating recovery from acute and chronic soft tissue injuries in ligaments, tendons, fascia, and muscles. Many notice the soothing and calming effects of infrared within about the first 30 minutes of a session, but immersing the body for an hour is most common. Avoiding a mini candy bar eating contest may be obvious, but what about the no-so-noticeable treats we consume when it’s cold? Spoiling yourself now and then is no big deal if you are active, hydrated and eating healthy food most of the time. Vegetables that are in season now such as pumpkin, Brussels sprouts, beets and sweet potatoes are healthy and vitamin-packed options. Not only are they readily available, but they can also be cooked or prepared in a variety of ways. Enjoying a healthy Halloween doesn’t mean you can’t indulge! 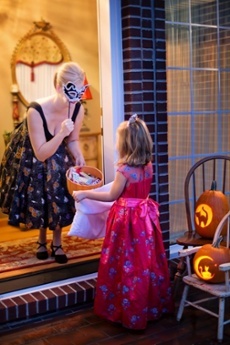 Get involved with the neighborhood festivities, decorate, pass out candy and burn calories while you’re doing it. Walking blocks to get a treat isn’t only for the trick or treaters, go out with family and friends and track your steps. Set a goal and when you meet it the sweet treat of your choice is all yours! When the days get shorter, and shadows appear ghoulish and not-so-healthy habits can emerge. Don’t let your health fall to the wayside. Stay on track with what you eat, your activity levels and taking care of yourself. Doing so will help you to finish out the season with a bang, it will be a new year before we know it!